Oct-Nov Rotations: Core Mkt = Wheat, Featured Mkt = Crude. 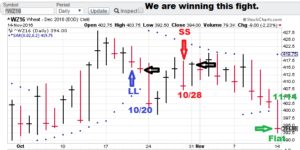 Signals: WZ = Sell 11/22 (TSP= waiting), CLZ= Buy 10/28 (TSP= 46.86). Model notes: The wheat model gave a sell. The models have been calling the grain market well this cycle. The latest trade on the crude market is looking better after going underwater for a couple of weeks, but the latest action has the trade going positive. This is very encouraging and continues to show the value of nonlinear analysis. We are back on track to feature (for the first time) some nonlinear portfolio construction samples. Exciting stuff! Note: ALL Mummy calculations use the TSP (Theoretical Signal Price)! The TSP metric is calculated by using the ‘close’ price of the trading day FOLLOWING the signal day (giving you plenty of time to take the signal). Wheat Trading Signals (Core). Wheat popped after the models went neutral, but now the models are returning to a bearish view. $390 seems like a likely target, if not lower. Crude (Featured). We have struggled during this signal as the crude market continued to find tough slogging during the depressing run up to the US presidential election. But post-Trump, the economic outlook has a more optimistic tint to it. With today’s close, we move into plus side of the ledger on this trade. Observation: Don’t sit around your Monday morning meetings giving each other high-fives with a two-star fund or strategy on the books. nonlinear portfolio construction anyone? Contact me for more info. Click the ‘Ranking’ tab to find out additional info. By the way, in 2017, I am only going to take on 4 clients. CTM can help and our rates are reasonable! Signals: WZ = Flat 11/14 (TSP= waiting), CLZ= Buy 10/28 (TSP= 46.86). Model notes: My last post (“Sea change?”) proved prescient on the coming Trump victory as the nonlinear numbers detected a future rumble in the financial landscape (both models flipped 180 degrees). We are doing pretty well on the wheat front with our first trade scoring a small profit. Today’s signal (TSP to be determined) looks to be much better. How about crude? Our first completed trade scored just short of $2.50. But the current position is getting uncomfortably underwater. We periodically update our models. On this round, we updated to v3.0 for the Oct-Nov cycle, however we still used the initial parameters of v2.0. CTM may update the parameters and run crude as our featured market for Dec-Jan. I was hoping to run a sample ranking (ala our premium product) during that time frame. Oh well. Wheat Trading Signals (Core). Wheat broke down this week and the CTM models signaled to go flat (neutral). The TSP calculation is to follow, but initially this looks to be a good trade for us. Reset and look for another entry. Crude (Featured). The previous completed trade was profitable but our current position is uncomfortably under water. Monday’s market action featured a reversal of sorts, the close settling well off the lows of the day. Today the market touched near the significant lows of early August. Where will we go from here? Nonlinear analysis suggests the bulls have the edge. Observation: Don’t sit around your Monday morning meetings giving each other high-fives with a two-star fund or strategy on the books. Nonlinear portfolio construction anyone? Contact me for more info. Click the ‘Ranking’ tab to find out additional info. By the way, in 2016, I am only going to take on 6 clients. CTM can help and our rates are reasonable! 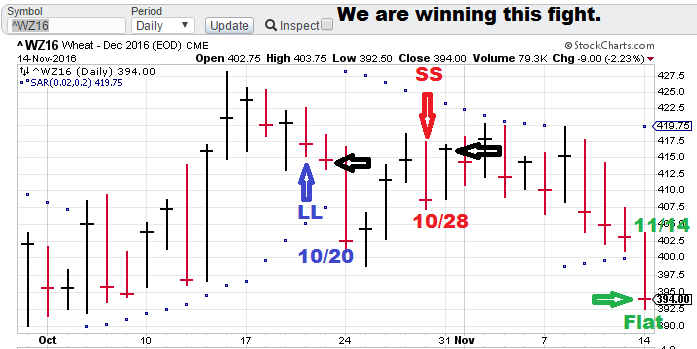 Signals: WZ = Sell 10/28 (TSP= waiting), CLZ= Buy 10/28 (TSP= waiting). Model notes: Do we have a sea change starting to emerge? Hillary is being investigated by the FBI (she can’t blame the Russians) and both the models flipped. We must wait for the TSP to reveal whether the previous trades are profitable. Crude looking good, wheat is more problematic. 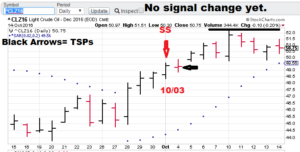 Note: The TSP (theoretical Signal Price) metric is calculated by using the ‘close’ price of the trading day FOLLOWING the signal day (giving you plenty of time to take the signal). Wheat Trading Signals (Core). 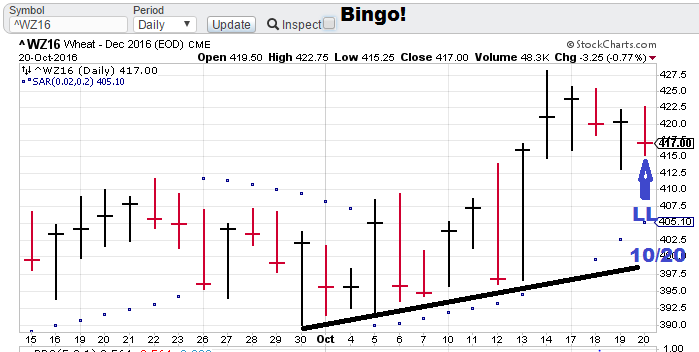 Wheat looks to be meeting resistance as it approaches the highs from Oct. 14 ($4.30-ish). The new trend line is setting up as negative. The technical question here is going to be whether or not this is going to range-bound (approx. $3.90 to $4.30). Let’s check Monday’s close to see if the previous trade was a loss (or how big). Crude (Featured). Now our model is reversing to the long side. The previous trade is likely to be positive. Friday was the lowest close of the month, so we are not expecting much follow-through selling. Observation: Don’t sit around your Monday morning meetings giving each other high-fives with a two-star fund or strategy on the books. Contact me for more info. Click the ‘Ranking’ tab to find out additional info. By the way, in 2016, I am only going to take on 6 clients. CTM can help and our rates are reasonable! 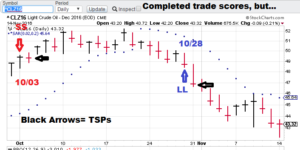 Signals: WZ = Buy 10/20 (TSP= waiting), CLZ= Sell 10/03 (TSP= 49.30). Model notes: We got the wheat signal (buy). It took us a while but the erratic daily volatility was probably a good thing to avoid. Crude reversed today. We are still out of the money, but the signal still looks promising. Wheat Trading Signals (Core). Wheat broke north of its range (approx. $3.90 to $4.10) but paused in the aftermath. The models are now positive. So a minor breakout and a recent uptrend. We are looking for higher ground here. We have the buy and are hoping for a good entry at tomorrow’s close. Crude (Featured). Crude reversed to the downside, again finding resistance at the 52 area. Let’s see if we can get some follow-through selling here. The models remain short and we are looking lower. Signals: WZ = Flat (TSP= NA), CLZ= Sell 10/03 (TSP= 49.30). 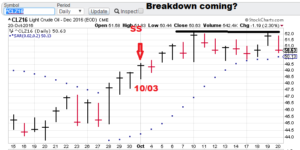 Model notes: Our crude signal is early but the models are still bearish. Wheat is remains flat. Crazy daily volatility is dangerous. Let’s see what the models give us down the road. Wheat Trading Signals (Core). Wheat broke north of its range (approx. $3.90 to $4.10) but closed significantly off the daily high. 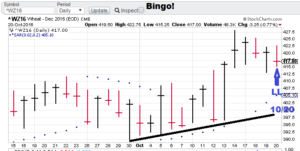 There has been a lot of daily volatility here, (see Oct 5,6,12 and 13), dangerous to tread. The models are still neutral, so the trade is not there, yet. Hang back. Crude (Featured). The crude signal appears early, but the models are not changing. We are looking for overhead resistance to hold at about the 52 level (Dec crude basis). I certainly would not try to reverse long yet. Contrary to wheat, the volatility is decreasing here. 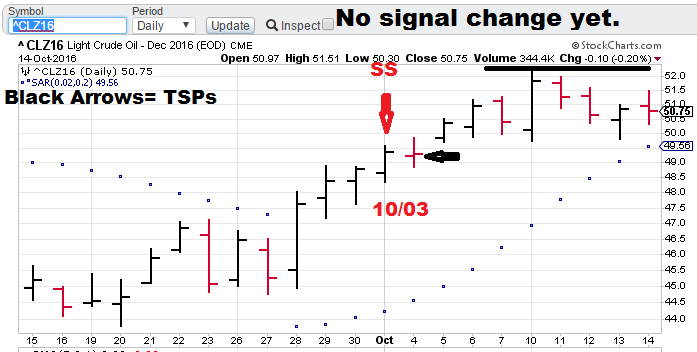 Signals: WZ = Flat (TSP= NA), CLZ= Sell 10/03 (TSP= waiting). Model notes: CTM is back tracking select markets. The hiatus is over and it is time to get back to it. We lead off with a crude sell. The wheat is still flat and we are waiting for a signal for the grain. Wheat Trading Signals (Core). Wheat is bouncing around the $3.90 to $4.10 range. The models are not giving the edge to either the bulls are the bears. We are near the low end of the monthly range but the readings are not giving us further guidance. Patience is the watch word, the Mummy stays flat. Crude (Featured). This is an exciting opportunity for us as I used to do work for another website (EnergyTrendAlert.com, under the Joseph Grain Company) tracking energy price signals. Now I return using a different and more exciting technology. The models gave us a sell based on today’s close. 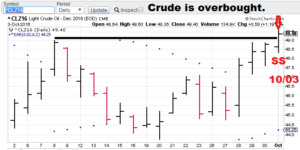 Crude is at the high end of the monthly range and the models are signaling instability ahead. The Mummy sees lower prices ahead!